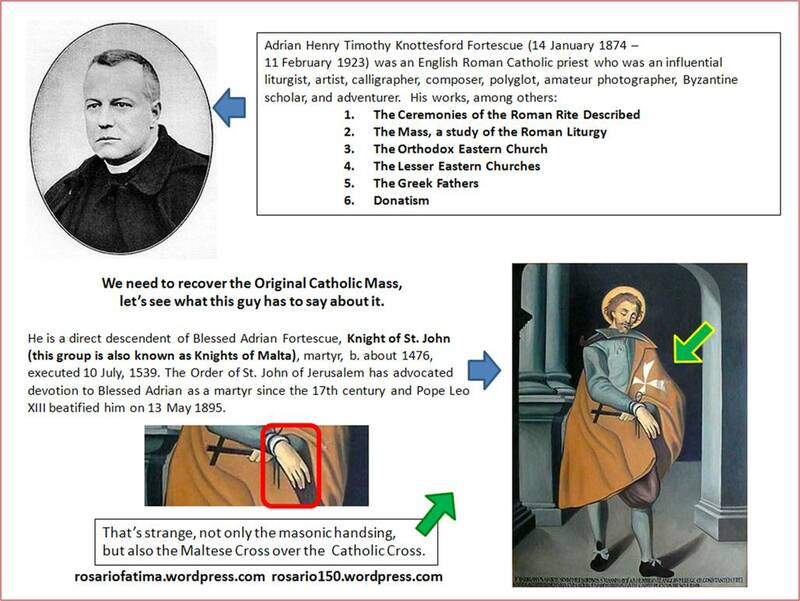 Adrian Fortescue, a direct descendant of the Blessed Adrian Fortescue (d. 1539, a Knight of Malta, by the way), was born on 14 January 1874 in Hampstead, London, into a Midland county family of ancient lineage and high position.His father was Rev. Edward Fortescue, a renowned High Church Anglican clergyman who was “highly regarded as a preacher and retreat master” and an active participant in the Anglo-Catholic Oxford Movement. His mother, Gertrude Martha Robins, was the daughter of Rev. Sanderson Robins, another Anglican clergyman, and Caroline Gertrude Foster-Barham, the scion of the Foster-Barham family of Jamaican plantantion owners and granddaughter of the 8th Earl of Thanet. 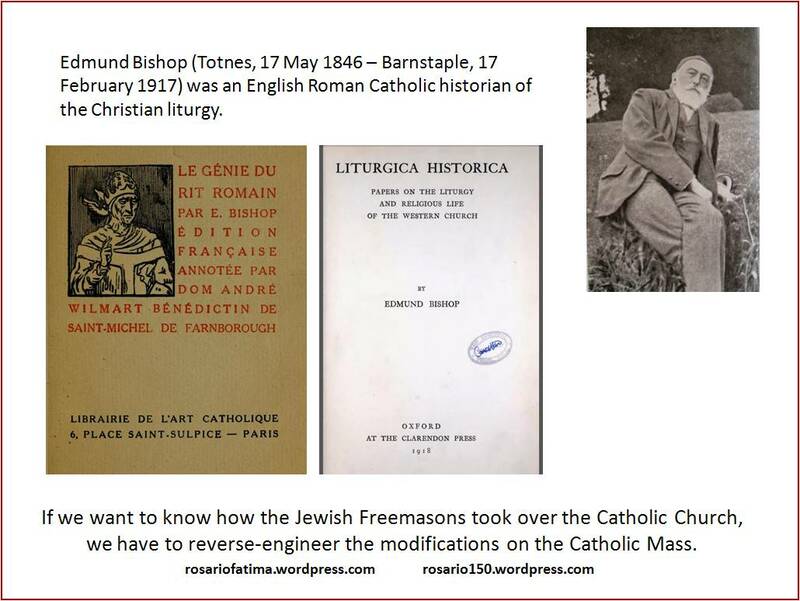 The best-known of Fortescue’s publications during his lifetime was Ceremonies of the Roman Rite Described, which he actually wrote not out of academic interest but to raise funds for construction on his church. 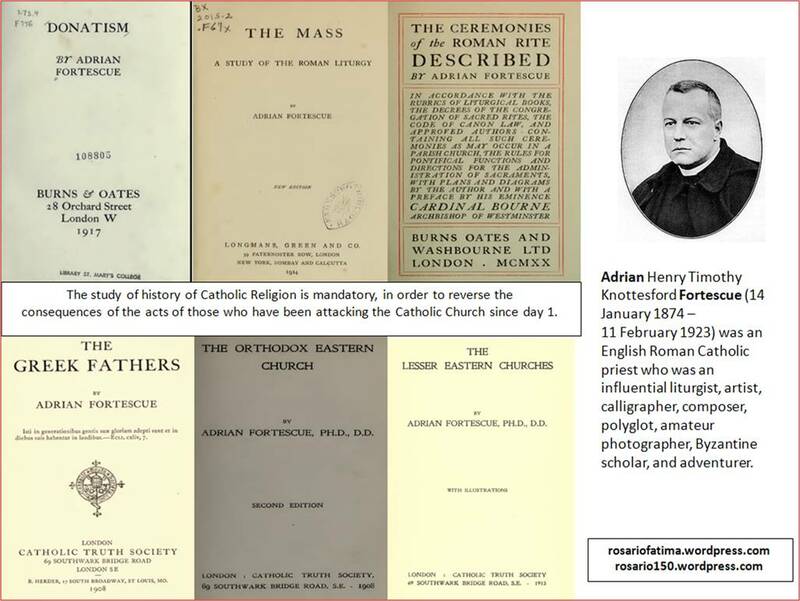 He also contributed many articles to the Catholic Encyclopedia (1907–1913), and it is in this context that his work has the most public familiarity today. Edmund Bishop and his works. his wide and varied learning. The easy office hours, after he had risen rapidly to a high place in his department, together with the vacations, left sufficient leisure for study, and this was turned to the fullest account. He bought books, copied documents at the British Museum and Record Office, read assiduosly and with amazing rapidity, and, gifted with a phenomenal memory, never forgot what he read. It was during this period that he transcribed, analyzed, and annotated the great “Collectio Britannica,” with copies of 300 papal letters dating from the fifth to the eleventh century. Failing the means of publishing the collection in England, he handed over the whole to the Monumenta Germaniae. I’m still looking for those letters. The Monumenta Germaniae Historica is available on this link. This is the result of the query “Edmund Bishop”. 1) The Genius of the Roman Rite, 1899. Liturgica Historica: Papers on the liturgy and religious life of the Western Church (English version, 1918). There are other works available on line, here there are the links.